HDFC Securities Walkin Drive: Aspirants here is great news for who are staying in Mumbai location. Recently HDFC Securities has come up with the latest notification. HDFC Organization is giving various job opportunities for the graduate people. Therefore for the sake of individuals, HDFC is going to conduct mega walkin drive in Mumbai on 7th August 2018. Candidates who are interested in working with HDFC as Telecalling, Telemarketing Executive designation must read this article. Moreover, who has good knowledge of Direct Marketing Hub they can directly attend for the HDFC Securities Walkin Drive at the mentioned venue. At present generation, job aspirants want to gain some of the real-time experience. For those people, we hope that the current HDFC Securities latest Job vacancies may be helpful. Therefore, all the Graduation freshers can take a complete look at this article and proceed for the next procedure. 1.7 How To Apply For HDFC Securities Walkin Drive? 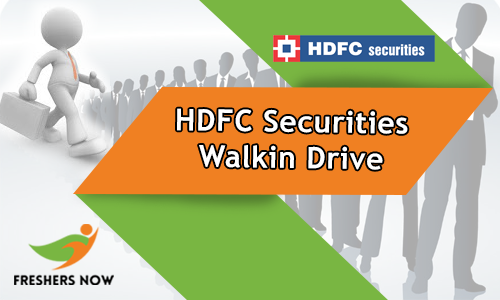 Aspirants who are meeting with the eligibility can attend for HDFC Securities Walkin Drive. Now, most of all candidates who had completed their graduation and having an experience they can directly attend. Therefore, as we all know that every year the company authority is recruiting the candidates based on their talent. Moreover, massive students are confused about how to apply/attend for the jobs in the HDFC Securities company. Because to reduce their doubts we have furnished all the details like HDFC Job description, HDFC eligibility norms, HDFC Walkin Date and time, etc. in this article. Hence must check this page until the end and grab the complete details before attending the HDFC Securities Jobs. Therefore, be in touch with our site on a daily basis and get the much more information. Job aspirants who have the ability to handle outbound calls and interested in work with the HDFC company can apply for the jobs by checking the provided eligibility criteria. Moreover, as we know that for every role, there will be some required job responsibilities. Therefore before applying contenders have to check the entire details of the particular position. And job hunters need to prepare to crack the test with the help of HDFC Placement Papers and HDFC Interview Questions. Furthermore, details about the HDFC Securities are mentioned below in an understandable manner. Moreover, nowadays most of all youngsters are waiting to prove their skills. And also, a huge number of aspirants are finding to know more about the new technologies. The company HDFC is Hiring Graduate freshers for Executive (Direct Marketing Hub) with HDFC Securities. Designation: Executive (Direct Marketing Hub). Job location: Andheri (East) JB Nagar, Chakala. Candidates should be able to Handle outbound calls. It is a Target based Job. Activation process for DMAT, Trading account. Promoting financial products by cross-selling. Contenders must have excellent communication skills in English. A sound knowledge of Indian Capital Markets. Shortlisted candidates can get facilities like Bus pick & drop from Ghatkopar & Andheri Station. Graduate freshers and experienced candidates are eligible to apply for HDFC Securities Walkin Drive. We are one of the leading stock broking companies in India. And also a subsidiary of HDFC Bank – a renowned private sector bank. As a stock broking company, HDFC Securities have completed 18 years of operations. There are innumerable reasons why you should opt for our services. The HDFC company is offering a suite of products and services across various asset classes, such as equity, gold, debt and real estate. It serves as a diverse customer base of retail and institutional investors. One-stop shop for investments be it stocks, derivatives, mutual funds, NCDs, insurance, bonds, currency derivatives, etc. HDFC has a product that suits each of your investment needs. Candidates can also bring friends if they are also looking for the same profile. If you are interested in attending can attend directly. Therefore contenders who have appeared for an interview within the last six months kindly ignore. Land Mark: Opposite Vitthal Kamat Hotel, Apna Dhaba Hotel. Near from Chakala, JB Nagar Metro Station (Gate no. 3). What Should Testaments Carry For HDFC Securities Walkin Drive? A hard copy of the latest resume. Identity proof issued by the government such as Aadhar card, PAN, Passport, etc. Certificates from schooling to UG, PG (original and xerox copies). How To Apply For HDFC Securities Walkin Drive? Job applicants attend for the HDFC Securities Walkin Drive with full pledge preparation. Aspirants who got selected for the HDFC Jobs will be trained about Indian Capital Markets. Therefore candidates have to work hard as much as required because of preparation is essential for the success in any job field. Check the latest HDFC Jobs 2018, HDFC Walkin Interview details from this page. And bookmark this page Freshersnow frequently.